Rhodesia has a written Constitution designed to uphold the democratic rights of all her peoples, and it ensures that the franchise shall be open to members of all races on equal terms. The 1961 Constitution, upon which the 1965 Independence Constitution was based, was accepted by a referendum after a conference where all races and all political parties were represented. 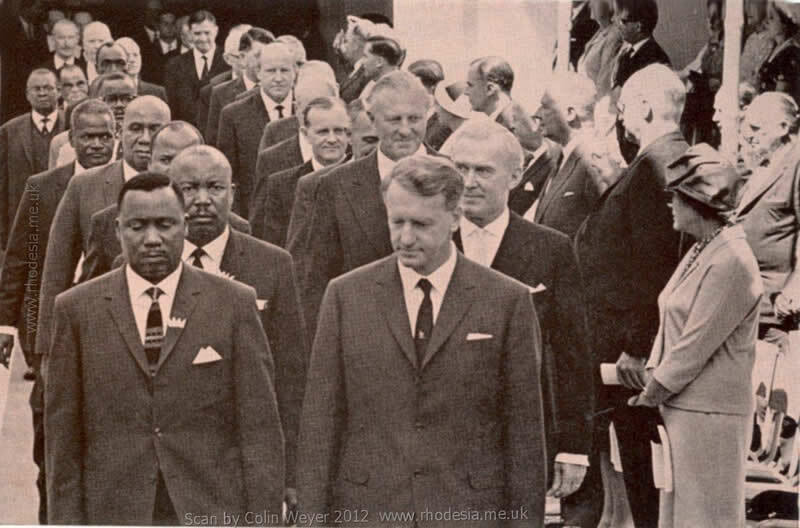 The conference was convened by the Rhodesia Government, and the delegates met in Salisbury under the chairmanship of the then British Secretary of State for Commonwealth Affairs, Mr. Duncan Sandys. The voting qualifications laid down were standard for all people, regardless of race. This was the system in relation to the main common roll, designated as the “A” roll. For the benefit of those who might not yet be able to produce the necessary qualifications for the “A” roll (although there was and is nothing to stop anybody in his or her own time acquiring these qualifications by self-improvement) a further development was the creation of a “B” roll with somewhat easier qualifications. The position today is that people of any race may qualify for either roll. The “A” roll covers the country’s 50 normal constituencies. The “B” roll covers 15 specially created electoral districts (for all practical purposes, 15 very large constituencies into which the whole country has been geographically divided). Still further development in all this was a system of “cross influences” between the two voting rolls (either way, the results on one roll being influenced by the results on the other) intended to curb racialism in political contests. Both the Declaration of Rights and the Constitutional Council are designed to safeguard the legitimate interests of all Rhodesians. (c) respect for his private and family life. If any person alleges that any of the provisions of the Declaration are being contravened in relation to him, he may apply to the Appellate Division of the High Court for redress. If the case is regarded as a proper and suitable test case, the costs may be charged against revenue. Measures to thwart racially discriminatory legislation are part of the law. The Constitutional Council is headed by a Chairman who has long been a judge of specified Superior Courts, or is a retired advocate or attorney of the High Court of Rhodesia of not less than 15 years’ standing. The 11 elected members must include at least two Europeans, two Africans, one Asian, one person of the Coloured community and two persons who are either advocates or attorneys of the High Court of Rhodesia of not less than 10 years’ standing. The present Council has a minority of Europeans. Members are elected at three-yearly intervals by an electoral college composed of persons of high standing in the country, including the President of the Council of Chiefs. The Constitutional Council must consider every Bill presented to the Legislative Assembly, and if the Council considers that any provision of the Bill would be inconsistent with the Declaration of Rights, it submits to the Officer Administering the Government an adverse report. The Constitution may be amended by a two-thirds majority in Parliament. The Declaration of Rights is one of the specially entrenched sections, which requires a two-thirds affirmative vote and, at a subsequent sitting, a two-thirds affirmative vote for the address which must be presented to the Officer Administering the Government for assent. Following a long tradition, at the Opening of Parliament the government and opposition members enter the chamber in pairs, led by the Prime Minister, The Hon ID Smith and the Leader of the Opposition, Mr JM Gondo. The franchise in Rhodesia confers “equality” upon all who acquire the necessary standards, regardless of their race. The standards for the franchise are closely correlated with standards in other spheres; and they are essential to the continuance of the civilization which prospers all Rhodesia’s inhabitants. Meanwhile the Government continues to strain its resources in raising the educational and economic levels of the Africans, to enable them to play a fuller part. Those who are excluded from the vote are excluded solely by virtue of fact that they have not demonstrated the necessary merit or ability. There is no special privilege reserved to the Europeans or any other section of the population. The franchise is for voters of all races registered on one of two rolls and extends to all citizens aged 21 years or over, resident in the country for more than two years, subject to certain property, income or educational qualifications. Of the Legislative Assembly of 65 members, 50 are elected to represent constituencies by the more highly qualified voters of the “A” roll, whilst 15, representing electoral districts, are elected by the voters with lower qualifications on the “B” roll. Both constituencies and electoral districts cover the entire country and the decision as to which roll a person qualifies for, or stands for Parliament on, is in no way dependent on race. Each member of the electorate can cast two votes, one for his choice of candidate in the constituency, and one for his choice in the overlapping electoral district in which he lives. By a system of cross-voting the “A” roll voters can influence the result of a “B” roll contest, and vice versa. This is designed to broaden the appeal of candidates to voters on both rolls. (d) Appointment to the office of Chief or Headman. Provision is made for a person paying for property by instalments to qualify for the “B” roll. A married woman is deemed to have the same means qualifications as her husband if she does not qualify in her own right. (This applies to one wife only – a necessary provision as polygamy is still practised by many Africans.) She has, of course, also to fulfil the other appropriate qualifications herself. An African newspaper has stated that had African nationalists taken advantage of the franchise opportunities available, they would today have been the official opposition party in Parliament. Under the Constitution, the Africans will attain “majority rule” just as soon as they demonstrate their fitness. by qualifying for the vote in sufficient numbers. There is no legal impediment to a Rhodesian of any race becoming Prime Minister, Member of Parliament, Judge of the High Court, Head of a Government Department or practising in any profession. Attainment of these positions is purely a question of merit and qualifications. Opportunities for advancement in all spheres are available to all races. * It should be noted that the 1961 Constitution did not introduce the concept of an equal non racial franchise in Rhodesia. The vote had been open equally to all races, whether white or black, since 1898. Both the original common roll (renamed the “A” roll in 1961) and the new “B” roll were open equally to a person of any race.